Society forces us to challenge ourselves to accept that participation in the public sphere is not just through the similarity with the people around one, but also through the differences. 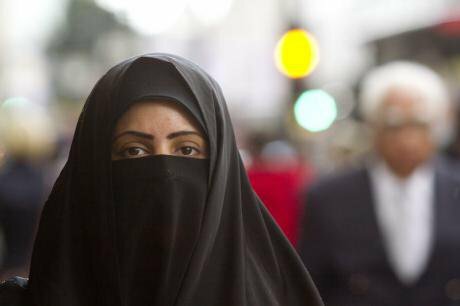 A Muslim woman wearing the niqab in central London. Amer Ghazzal/Demotix. All rights reserved.In the British newspaper The Independent, Fiyaz Mughal, the director of the organisation TELL MAMA, which documents incidents of Islamophobia in the UK, has defended the Niqab in the light of the British liberal tradition. I agree with him. "141. The Court observes that this is an aim to which the authorities have given much weight. This can be seen, in particular, from the explanatory memorandum accompanying the Bill, which indicates that “[t]he voluntary and systematic concealment of the face is problematic because it is quite simply incompatible with the fundamental requirements of ‘living together’ in French society” and that “[t]he systematic concealment of the face in public places, contrary to the ideal of fraternity, ... falls short of the minimum requirement of civility that is necessary for social interaction” (see paragraph 25 above). It indeed falls within the powers of the State to secure the conditions whereby individuals can live together in their diversity. Moreover, the Court is able to accept that a State may find it essential to give particular weight in this connection to the interaction between individuals and may consider this to be adversely affected by the fact that some conceal their faces in public places (see paragraph 122 above). 142. Consequently, the Court finds that the impugned ban can be regarded as justified in its principle solely in so far as it seeks to guarantee the conditions of “living together”. I strongly believe this not to be correct. I am living in an area of London that is in part inhabited by people of strict Islamic cultural commitments. One of our closest neighbours as well as a lady in my daughter's school adhered to these dress codes. We also knew another mother who wore a Niqab, whose kids my daughter played with in the playground, and with whom we always had frank and open discussions on religion, including Judaism and Islam. There may be arguments on other grounds campaigners would like to raise, but the one that the ECHR brought up, on the dress not being social is not correct and totally subjective from the perspective of your average unexposed European. It lacks convincing evidence of this being so. In my personal life, I have had more interaction with these women than with some of my uncovered neighbours, of any faith or none. We always exchanged greetings, and had friendly chit chats. It was always quite clear to me that the person under the garment is but a woman and fellow human being, a mother, a member of the community I live in. I think that the judgment of the ECHR says more about the western fear of confronting their own demons in actually addressing a woman in such a dress code like any other person with respect, an open mind and curiosity (minus shaking her hand, if you are a man of course). If the argument of the ECHR was about free choice or gender equality access, it would perhaps be different. The case the ECHR court judged upon concerned however a woman who was documented as wearing the dress, Niqab, as part of her free choice, being her current way of expressing her particular cultural understanding, rightly or wrongly, of how to practise her religion. "It seems to us, however, that such fears and feelings of uneasiness are not so much caused by the veil itself, which – unlike perhaps certain other dress-codes – cannot be perceived as aggressive per se, but by the philosophy that is presumed to be linked to it. Thus the recurring motives for not tolerating the full-face veil are based on interpretations of its symbolic meaning. The first report on “the wearing of the full-face veil on national territory”, by a French parliamentary commission, saw in the veil “a symbol of a form of subservience” (see paragraph 17). The explanatory memorandum to the French Bill referred to its “symbolic and dehumanising violence” (see paragraph 25). The full-face veil was also linked to the “self-confinement of any individual who cuts himself off from others whilst living among them” (ibid.). Women who wear such clothing have been described as “effaced” from public space." As the judgment noted itself, the amount of women who choose to wear this is so small, that there is a question-mark over whether there was a proportionate requirement in France to legislate at all. The court also remarked that these women are in fact vulnerable to Islamophobia and that the law must be careful not to burden these women further or increase the hatred against them. Hatred like the one that is suspected to have been the reason for the killing of the Saudi resident and student in the UK Nahid Almanea, 31 who was wearing the abaya - a full-length blue dress and a multi-coloured head-cover. Almanea was to be enrolled as a PhD student in Life Sciences, having achieved more, and possibly having had more serious social conversations, than the European average. But my motivation here goes beyond just personal experience. The history of hatred against Jews teaches us that it was once the case, and often still is, that Jewish men and sometimes women are seen as out of touch and non-modern. If you read Mein Kampf you will notice that Hitler writes in one early chapter that he understood the true nature of the "daemonic Jew," when he saw an Orthodox Jew in Vienna with his black anti-modern garments. Beyond that, I am a liberal. If I had a neighbour who was a Goth, or in drag or whatever, I'd defend that person too. Society forces us to challenge ourselves to accept that participation in the public sphere is not just through the similarity with the people around one, but also through the differences. As I have encountered in my personal life, it is totally possible to engage in conversations with women wearing full cover dress. Perception can cloud the ability to approach the human being wearing the dress, and can also assume that there is an anti-social position where this is not necessarily so. But that this was entertained in a court of law as substantial as the ECHR, albeit with two dissenting voices, is to say the least disappointing. I believe that the ECHR should have the burden to prove that the preamble of ‘living together’ is in fact breached by reference to solid research. It is my guess tht they would never be able to make a conclusive case here.